JEDDAH — Saudi Arabia will host for the first time the opening round of the ABB FIA Formula E Championship in Ad Diriyah, Riyadh, on Dec. 15. This was announced by Prince Khalid Bin Sultan Abdullah Al-Faisal, Chairman of the Saudi Arabian Motor Federation (SAMF). 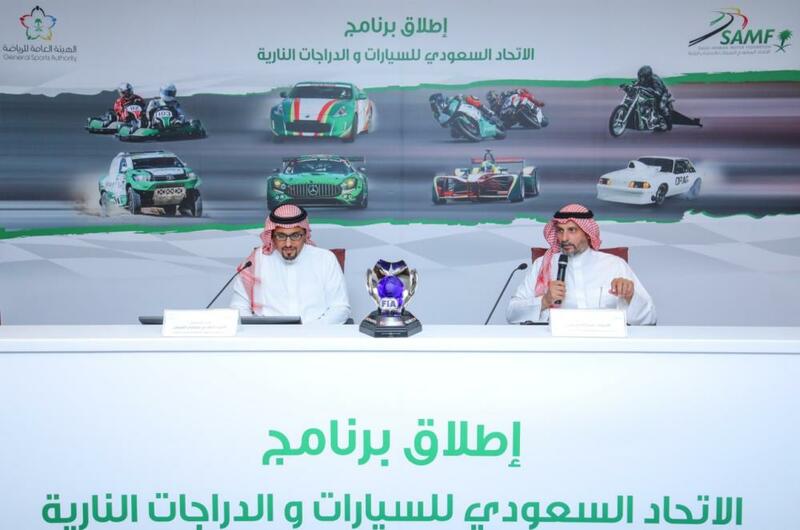 In his speech during the press conference held recently at the Conference Hall in King Abdullah Sports City in Jeddah to reveal the new program for the Saudi Arabian Motor Federation (SAMF), Prince Khalid said that the Saudi Arabian Motor Federation has set out an ambitious plan to implement programs in line with the Kingdom’s Vision 2030 and life quality programs. The Chairman of the Saudi Arabian Motor Federation, as well, announced the development and launch of eight programs concentrated mainly on both social and tourism aspects to form the working core of the new Federation. He underscored the great role of the General Sports Authority, represented by Counselor Turki Bin Abdulmohsen Al-Sheikh, and the Vice President Prince Abdulaziz Turki Al-Faisal, in supporting the Saudi Arabian Motor Federation programs. Prince Khalid also ascertained that SAMF will focus during the next period on the activation of social aspects and tourism, as chosen by a large section of society, meanwhile, SAMF will not cease supporting the sports side, saying that the new Federation is working hard to defeat the obstacles facing enthusiasts of Motorsport activities. — The development of a new motor modification system (for cars and motorcycles). — The development of a system for the importation of limited edition sports vehicles. — The development of a system that allows driving classic/vintage cars. — The development of motorcycle driving system. — Defining of crowds and gatherings. — The development of a special car plate system for sports vehicles. — The development of the Saudi Arabian Motor Federation program for safe driving. — The Saudi Arabian Motor Federation decision to concentrate on the social and tourism aspects in the coming phase, as well as resolving of problems facing youths and Motorsport activities. Meanwhile, Deputy of the President of SAMF, Abdullah Bin Salem Bakhashab, presented a detailed presentation of SAMF programs, local and international tournaments that will be hosted by the Kingdom in the coming few months. Bakhashab further confirmed that the coming motorsport season includes five championships, including Drift, Autocross, Karting, Sand Drag and Tatees, along with the pre-scheduled tournaments including regional rallies. Bakhashab added that the Motorsport season starts on June 29 and lasts until the end of December 2018, in addition to hosting one round of IPP Formula E championship in Riyadh. Deputy President of SAMF stressed the importance of the programs presented in broadening the base of sports talents and practitioners, as well as increasing of SAMF members, which come in line with the Kingdom Vision 2030 and contribute to achieving the sports objectives, and therefore give them full opportunity to develop their skills and participation in motorsport activities outside Saudi Arabia.